With the holidays fully upon us, I always feel this time of year is a great for talking hobbies and collectables. Whether it’s finding gifts for car-loving friends and family, or just planning out ways to stay busy and warm over the winter, ’tis the season for miniature automobiles. Or maybe I’m just a geek that loves posting about this stuff? Either way, I wanted to share with you guys a recent visit to one of my favorite collectables shops – Prestige Hobbies in Anaheim, California. 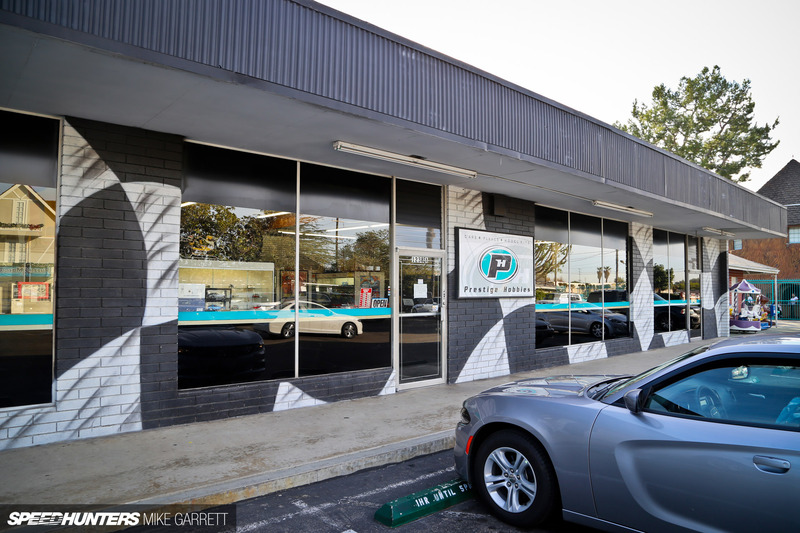 Prestige has been doing business from its Beach Boulevard location for close to 20 years now. 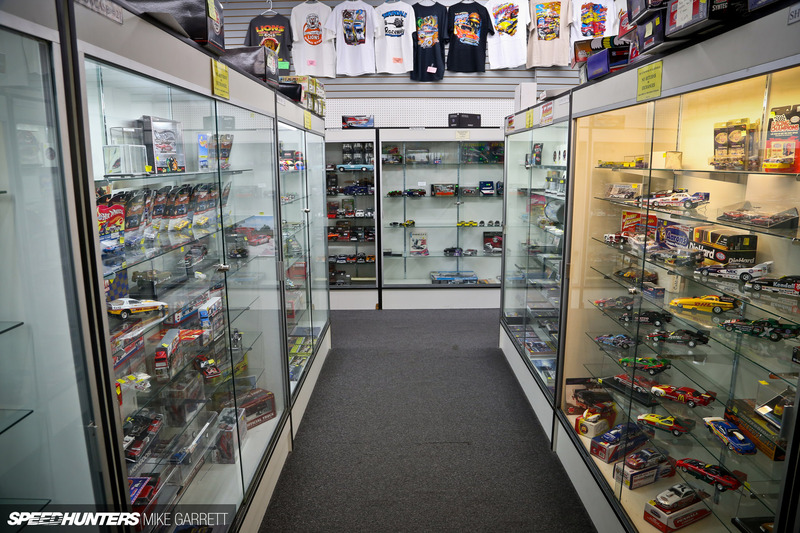 This actually isn’t the first time I’ve covered the shop here on Speedhunters, but that was several years ago; so during a recent trip to Orange County I thought I’d check in and see what was new. 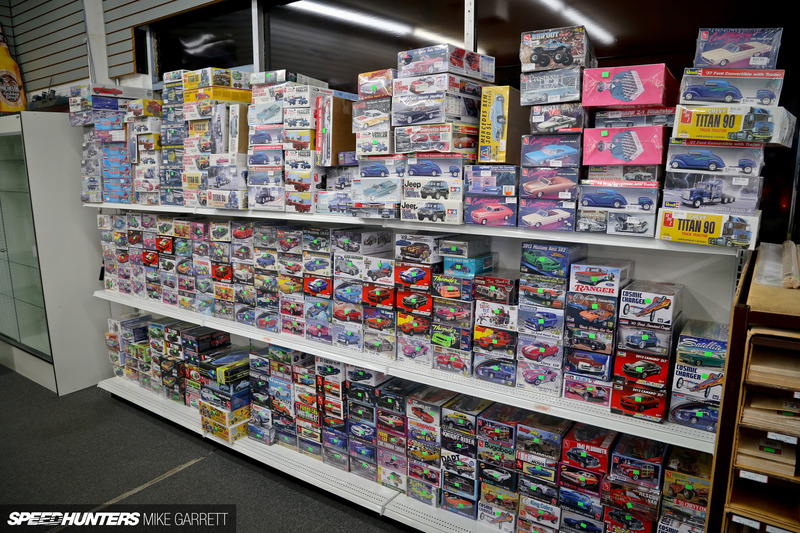 While I don’t think I’ve ever visited a hobby shop I didn’t like, Prestige Hobbies is particularly great because it’s dedicated almost exclusively to scale automobiles. I’ve been coming here since I was in elementary school, and my brother and I would beg our dad to take us whenever we were in Anaheim visiting relatives. Prestige has a mix of both normal retail inventory plus areas dedicated to vintage and rare items from consignment sellers. It means you’ll find something different every time you stop by. 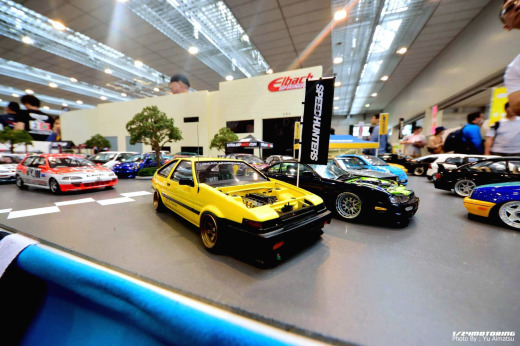 Right on up to highly priced and highly detailed die-cast replicas for the scale model connoisseur. Like most great hobby shops, Prestige is a place where you can kill a lot of time, so I’ll go ahead and share some the more interesting things I found during my visit this month. While the shop carries a bit of everything, one particular strong point is the American motorsports stuff. Given that Southern California is considered the birthplace of organized drag racing, there’s an especially large selection of vintage quarter-mile goodies. And regardless of whether you’re a fan of drag racing history or not, you just have to love the attention to detail on these front-engine dragster replicas. 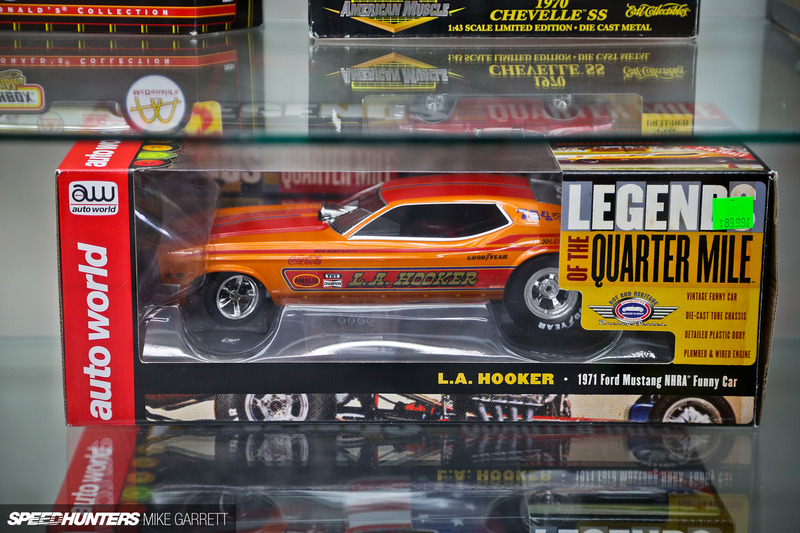 I’ve fallen in love with these rail dragsters after seeing them at Famoso so many times. 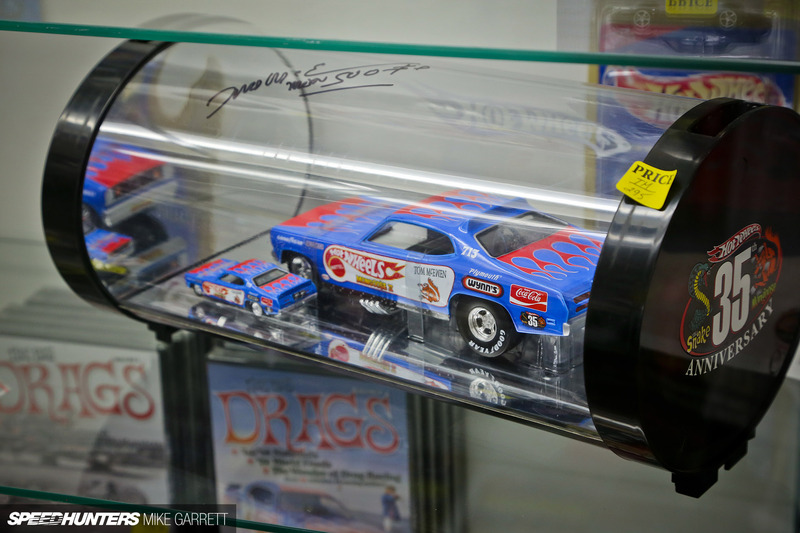 Funny car replicas are also plentiful in Prestige’s inventory, and I especially liked this Auto World replica of the Jungle Jim Camaro. 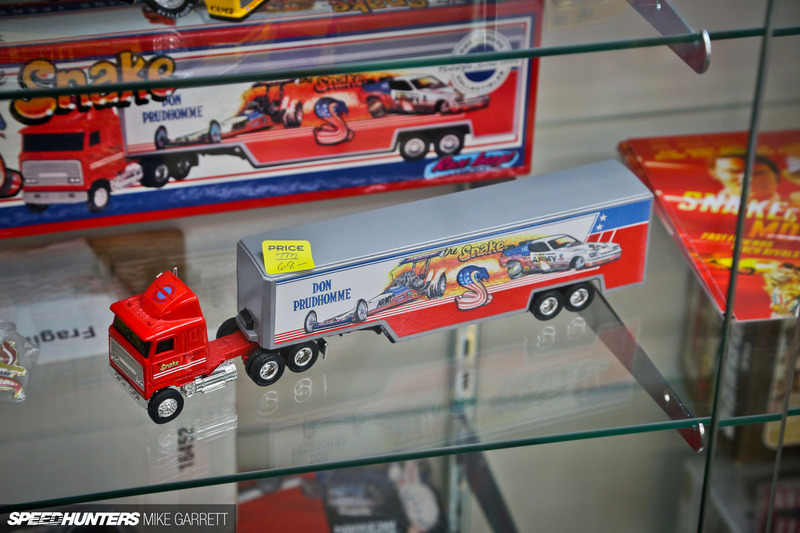 And it’s not just die-cast models either; you’ll also find stickers, DVDs, t-shirts and other items that pay homage to the golden years of drag racing. 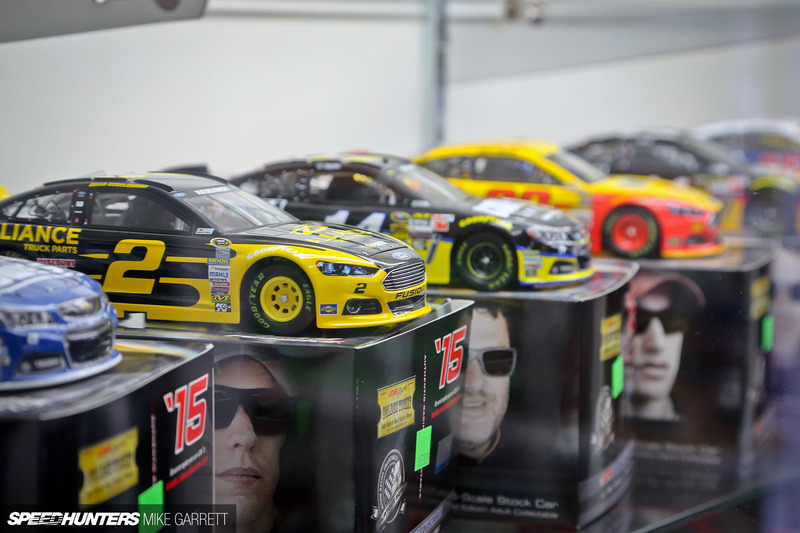 Taking up an equally large slice of shelf space are NASCAR replicas. 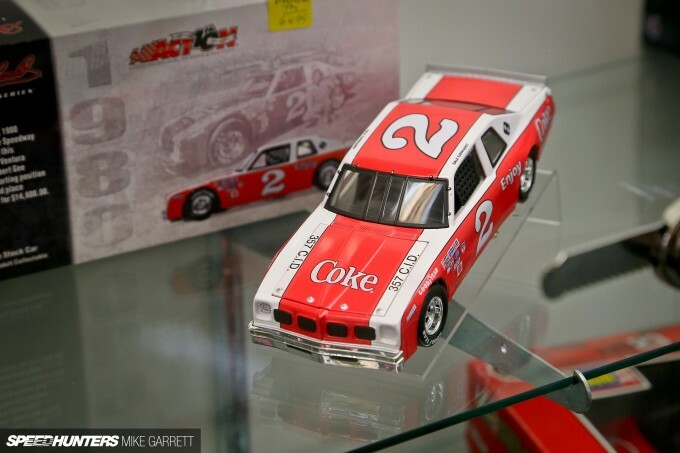 While I’ve never collected these myself, I can certainly see the appeal in it given the huge number of special liveries Sprint Cup cars run over the course of a season. For example, here we’ve got a Lionel replica of the throwback car that Jeff Gordon drove at Bristol in 2015 as part of his farewell season. 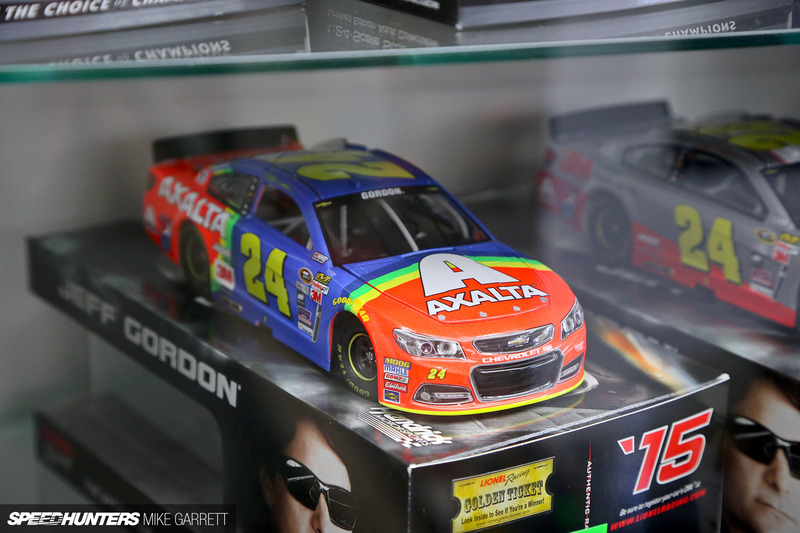 You have to love the old school ‘Rainbow Warrior’ style. 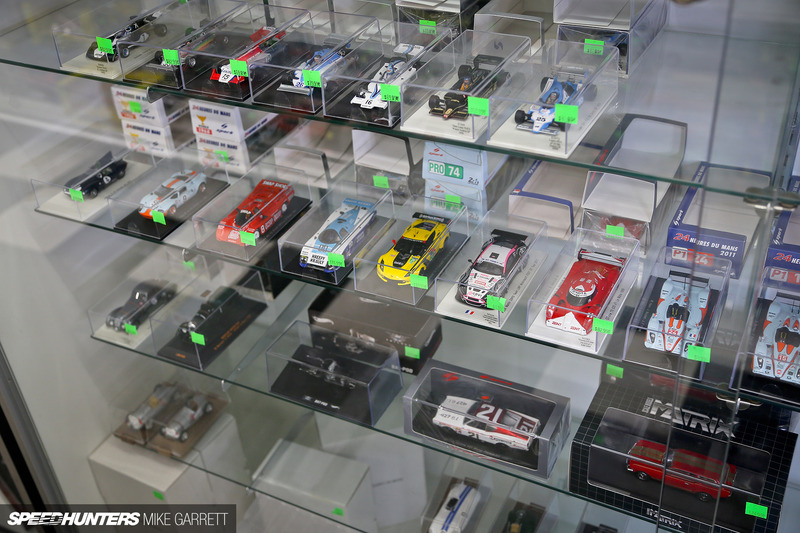 It’s not all American motorsport stuff though. 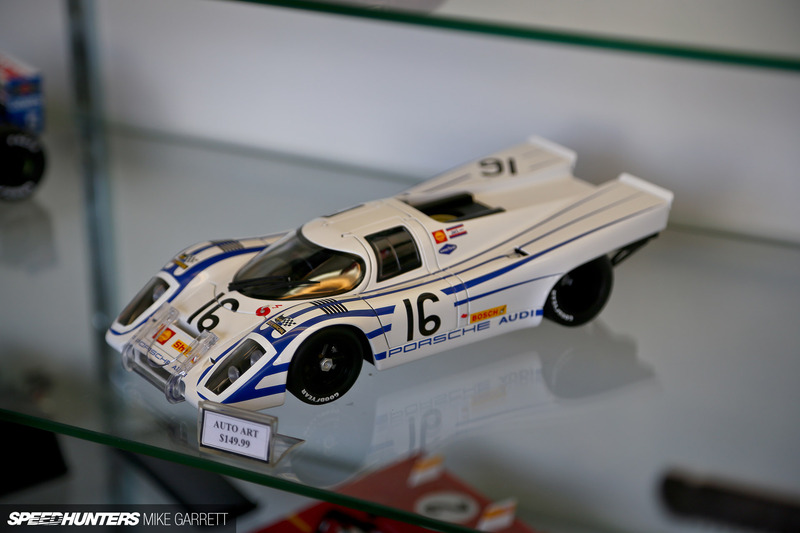 This AUTOart Porsche 917 would be a fantastic stocking stuffer, wouldn’t it? 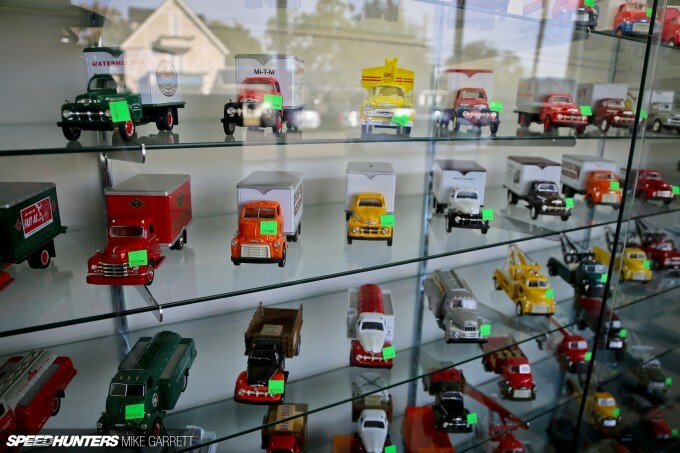 I don’t know much about these miniature vintage commercial trucks, but I do know a child version of myself would have given anything to play with them. I suppose it’s never too late to give up on the dream, right? 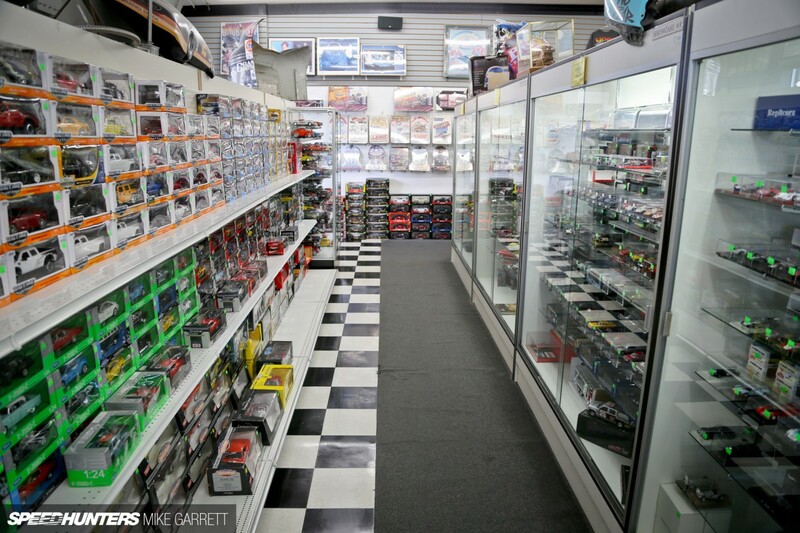 Needless to say, Hot Wheels cars make up a huge part of the inventory. 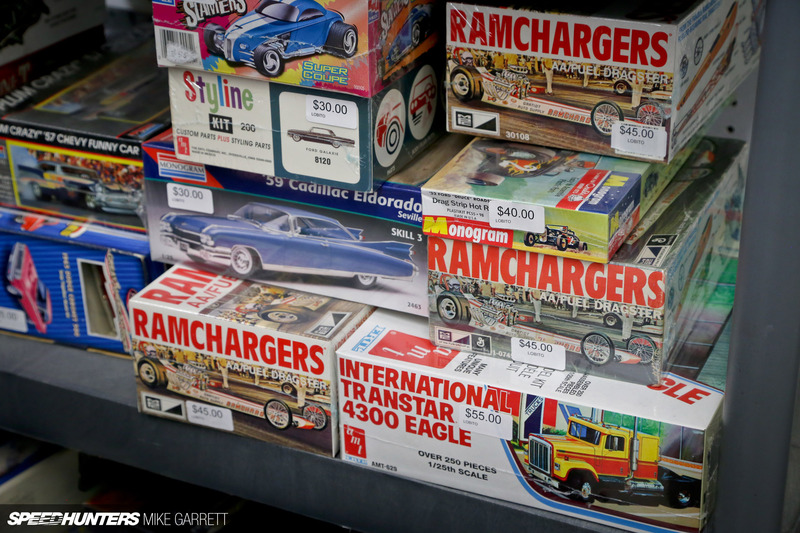 There are new releases, rarities, and plenty of older issues as well – many of which I distinctly remember from my childhood days. 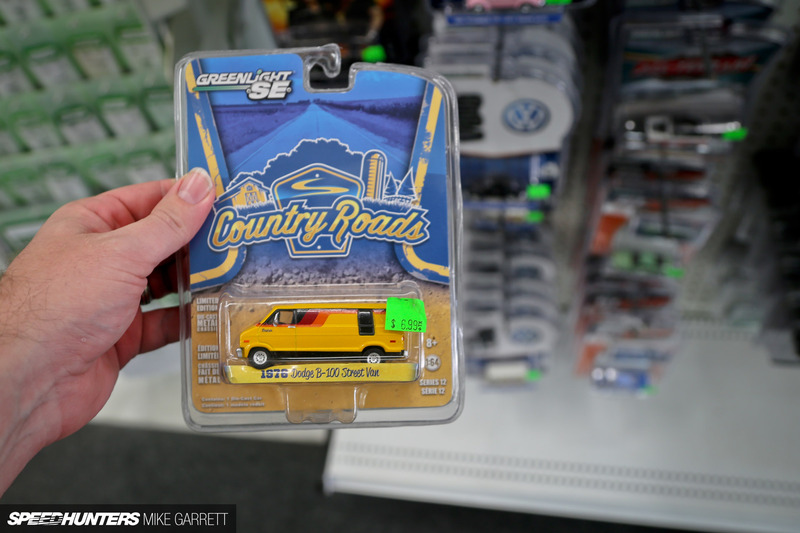 There’s lots of other 1:64 scale die-cast stuff as well, including this super-cool Dodge Street Van from Green Light. 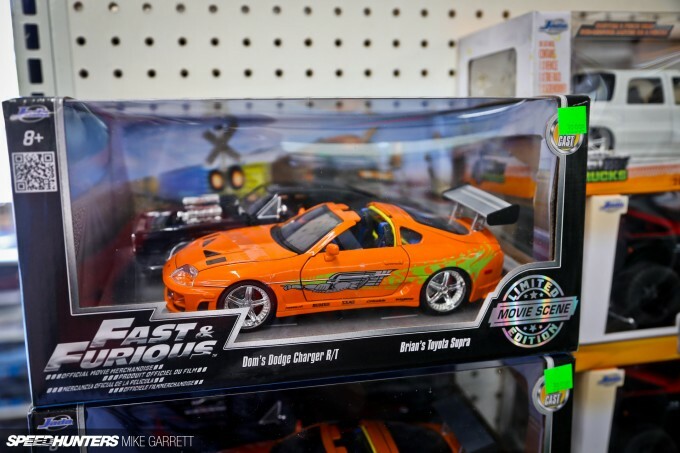 It’s really awesome to see die-cast companies making replicas of niche vehicles like this. 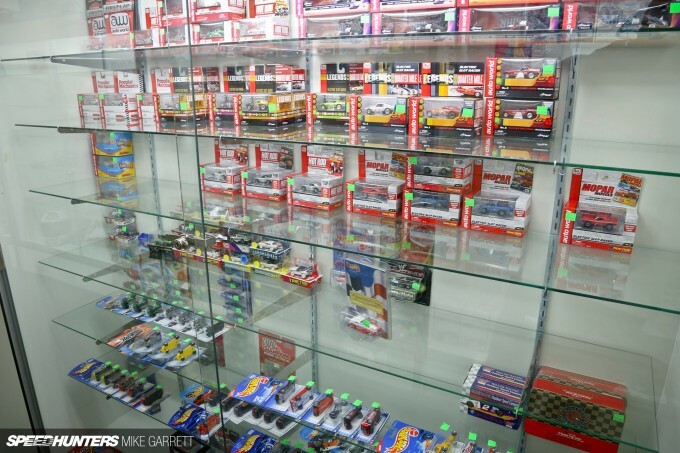 I was also pleased to see that the shop has a decent amount of Scalextric slot cars and accessories – stuff which isn’t easy to find here in the US. Playing with slot cars was once something that led many kids to love cars as adults, and while that might not be the case now, Scalextric is keeping the dream alive with some damn cool products. 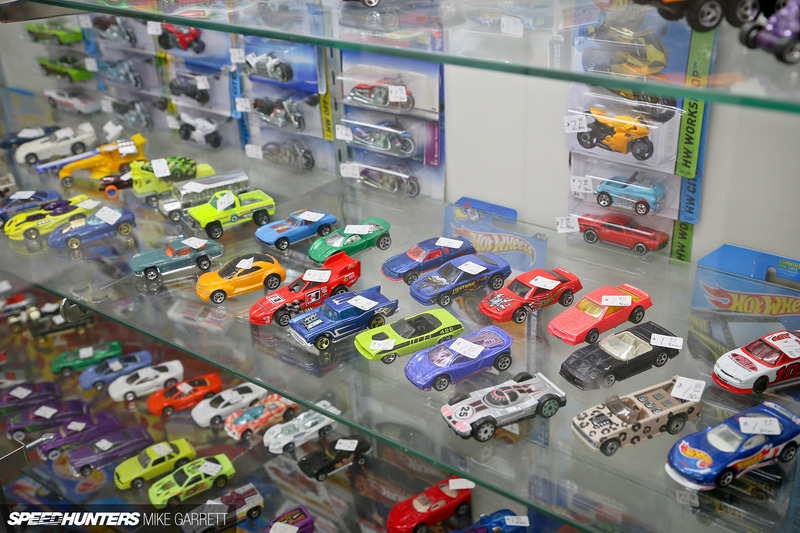 Along with the aforementioned high-end die-cast models, Prestige Hobbies also has a large section full of more affordable 1:24 and 1:18 scale die-casts from a variety of brands. There were plenty of muscle cars, exotics and the like, but I was also surprised to find some much more unusual replicas. Dodge Diplomat anyone? And check out this little set-up featuring Dom and Brian’s famous street race from the original Fast & Furious movie. It really makes me yearn for the good old days of 2001. 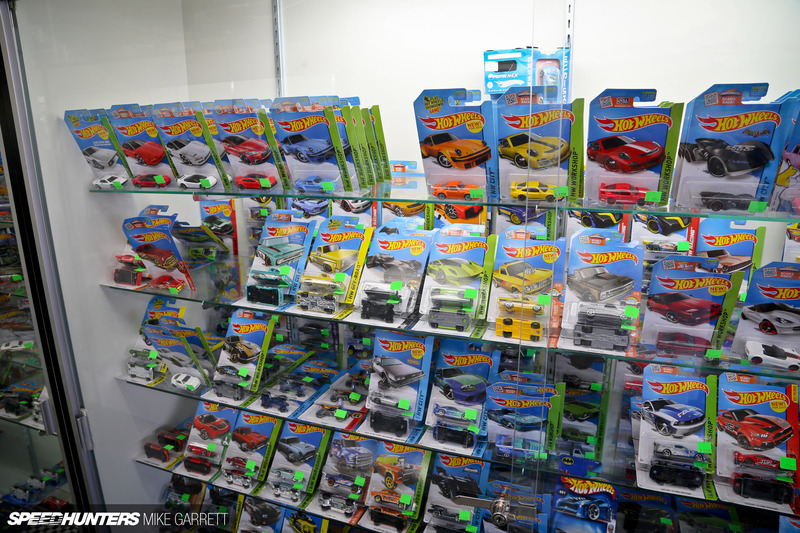 In addition to all that, there’s another part of the Prestige store dedicated exclusively to plastic model cars – both modern kits and re-releases, plus a variety of vintage kits spanning several decades of modeling. 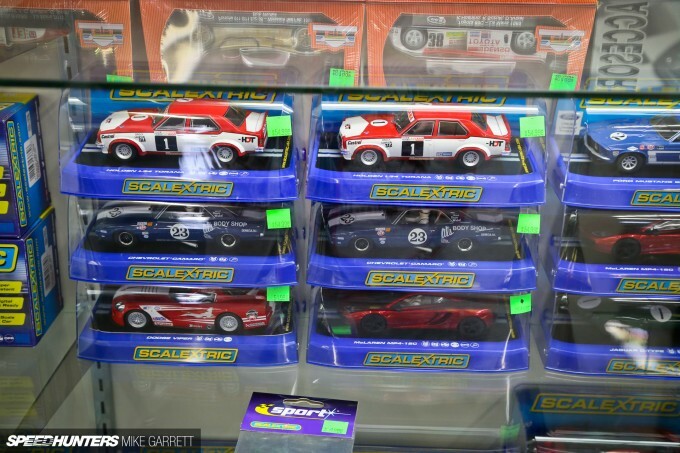 You won’t find many international kits here, but when it comes to American brands, the selection is downright impressive. 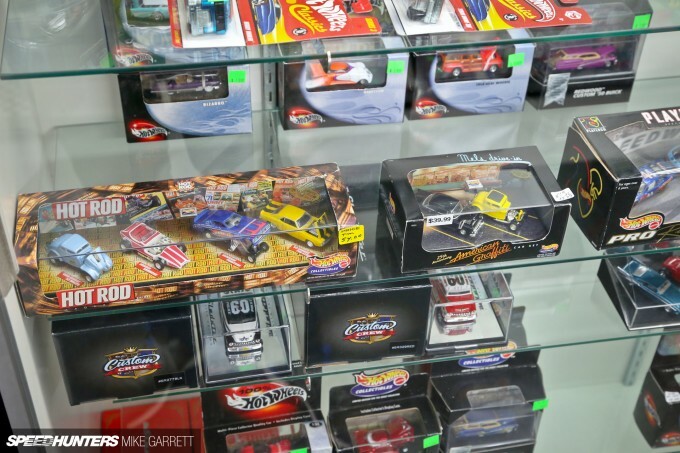 Whether it’s classic kits that have been reissued, or genuine old stock from the ’80s and ’90s, the nostalgia factor in this section is huge. 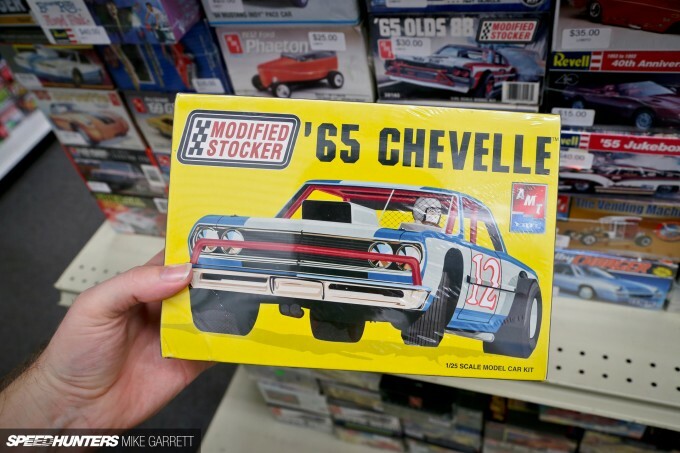 Take a look at this AMT Chevelle Stocker kit – the box art alone is worth it. 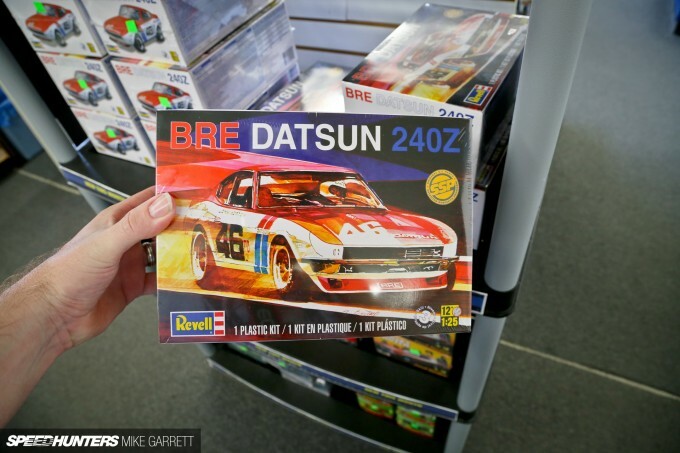 And speaking of reissues, occupying some prime real estate in the new releases area was Revell’s kit of the BRE Datsun 240Z. Once again, it’s one of those cases where you almost want to buy two – one to open up and build, and one to keep packaged and stare at. And speaking of the old school kits, check out this MPC Shelby Dodge Charger I found. 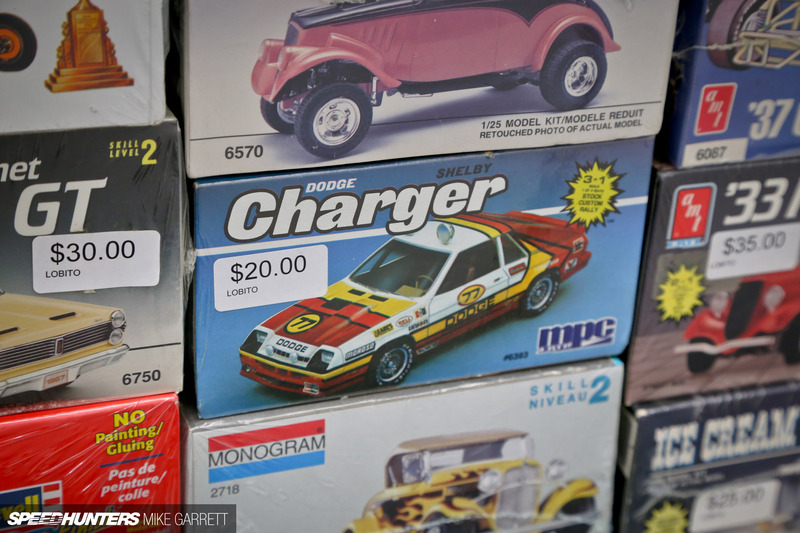 It might not be the kind of Charger most people first think of, but I dig it nonetheless. Even cooler was this MPC Chevy Cavalier with a full IMSA-esque wide-body kit. I want to see this in real life now. 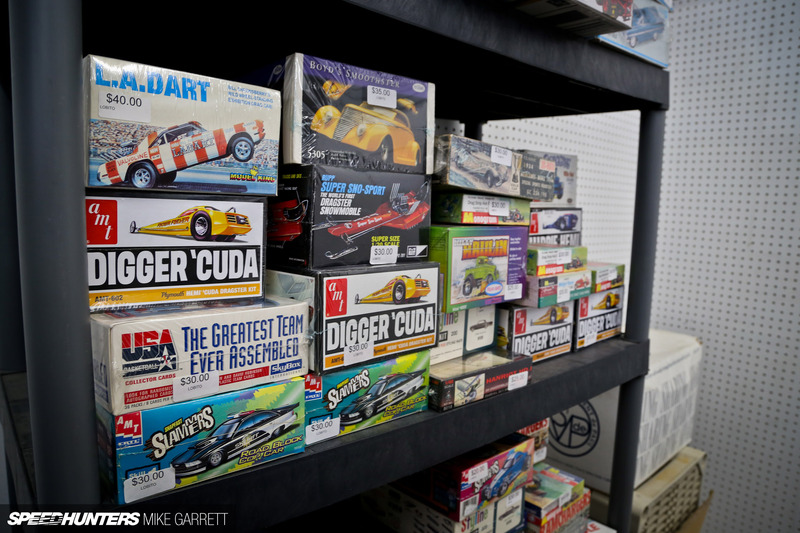 These days you can find just about anything you want on eBay or one of the other big online retailers, but there will always be something great about going to an actual hobby shop and finding stuff the old fashioned way. That’s why I hope places like Prestige Hobbies stay around forever. When I have my own kids, I’d love to bring them here. 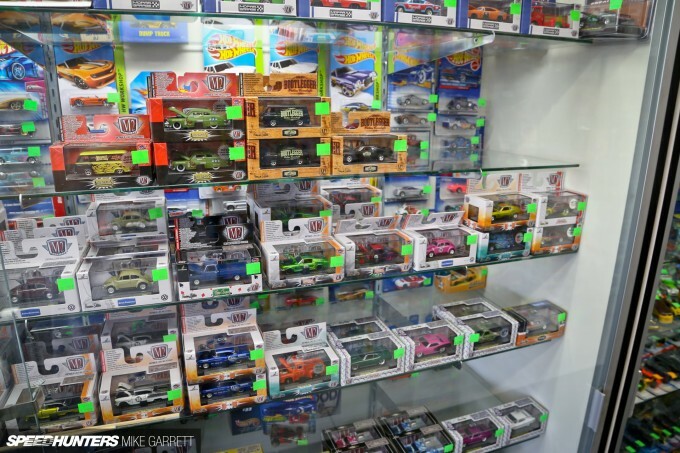 Now, you might be wondering what I actually bought during this visit, but I know that my family members read the site, so I’m not going to spill the beans just yet. Maybe check back with me on December 26? Oh man, I was just there on Friday! Love going to this place, and you can dump the wife/kids off at Adventure Land while you shop. Bonus. Right in the wallet. I'd live there. Surprisingly empty every time I go. One wonders how they stay in business. Wow that looks like a fun place to go! 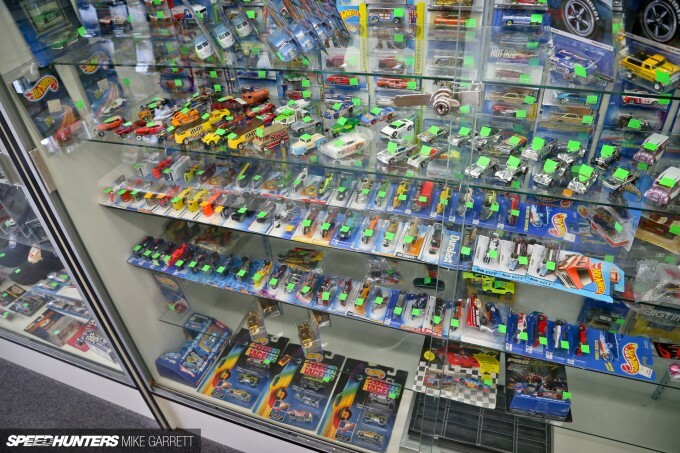 Coca Scola The sad state of any hobby shop nowadays honestly. But they are still there and the best way to make sure they are in the future is to visit, support, and take your kids and get THEM hooked. 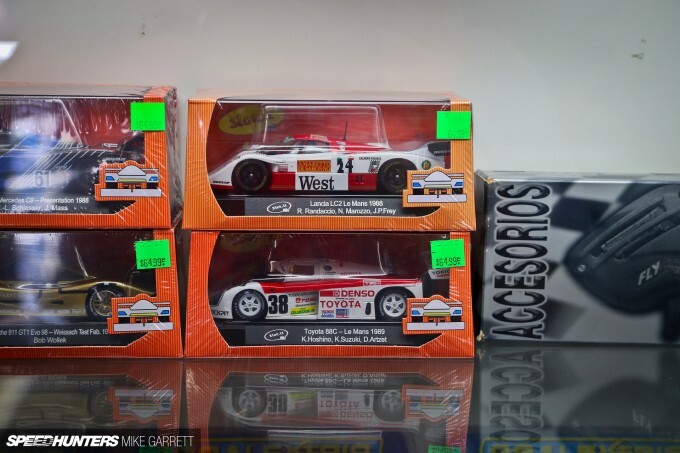 These three, along with those seen on the 5th Bonus shot (gib more GT1/GT2/GTE/GT3 now please), are all I want for Christmas. Actually I wanted some more (M3 GT2, F1 GTR, this 5-pack, other cars on my wishlist), but I've been so magnetized with those three. 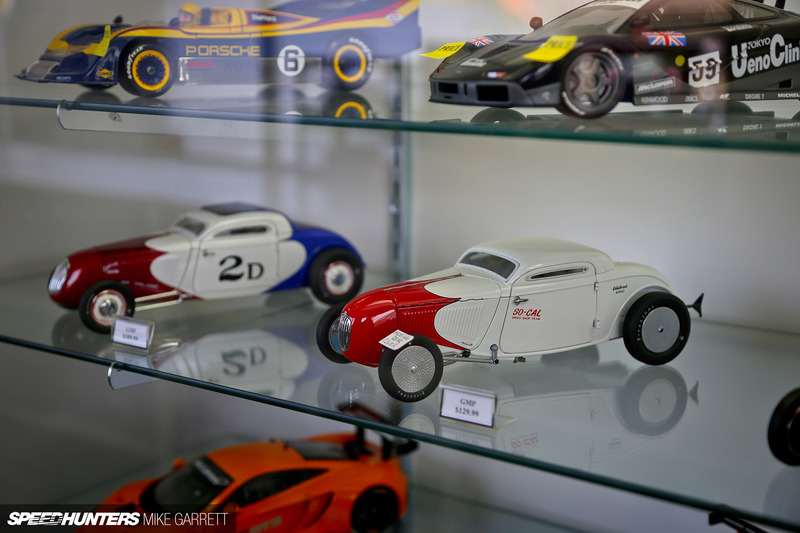 Is it true when collectors say, that the auto art models are the best? 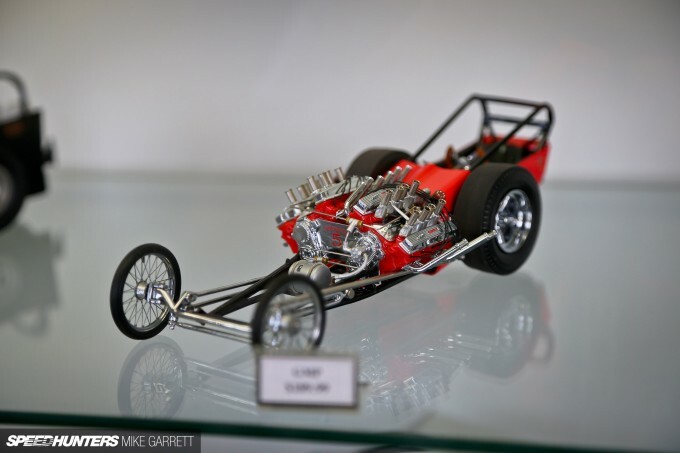 ( and most expensive ) a friend of mine build a very big "Pocher Ferrari F40" 1/8 kit this thing was huge! I'm digging all the TV Tommy Ivo swag. Nailhead pioneer. 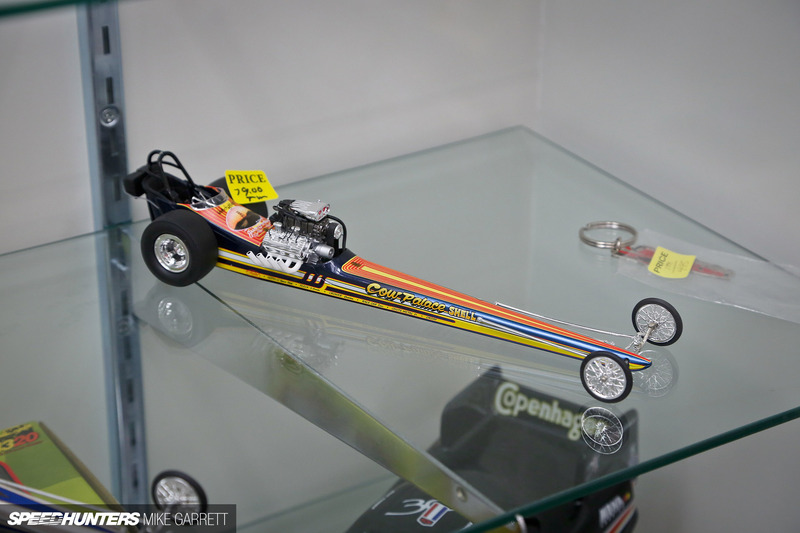 I would love to get my hands on a scale replica of the "Showboat" quad Nailhead AWD dragster. 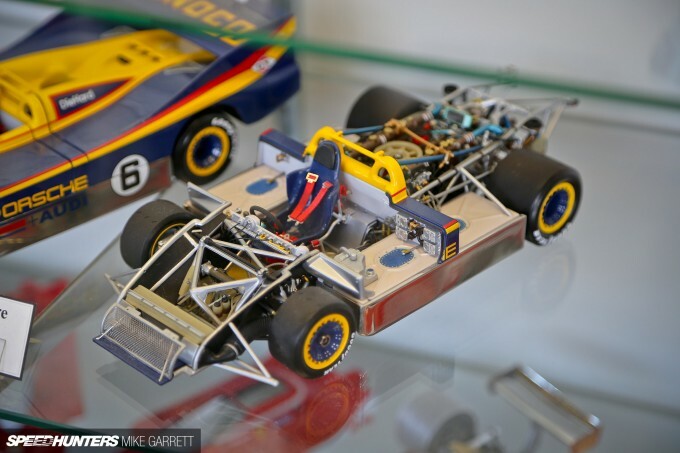 awesome, another diecast and plamo heaven! 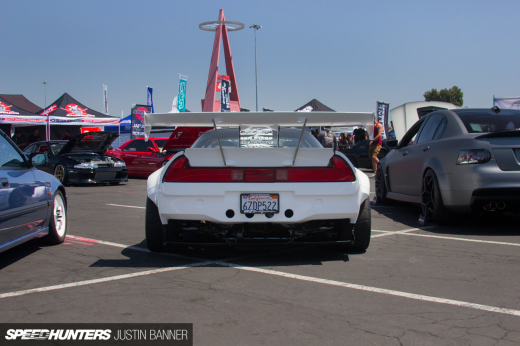 Gianluca FairladyZ yup, they are the best. 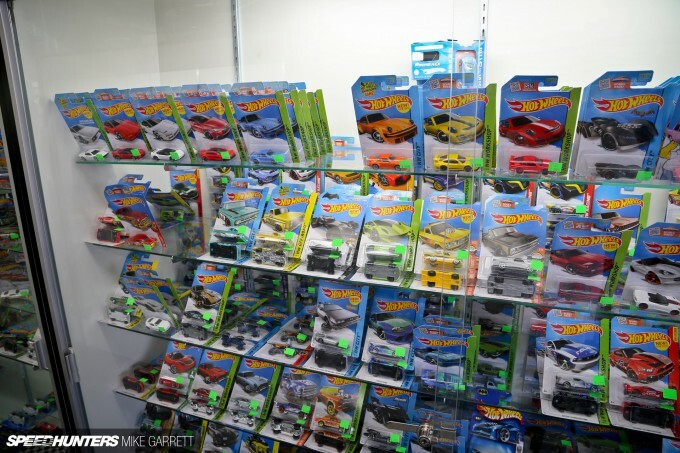 that pocher f40 is a dream kit of mine, has your friend finished his? has he posted it online? nu gundam 93 Gianluca FairladyZ you won't believe that, it's collecting dust in the corner of his hobby room yeah it's finished! 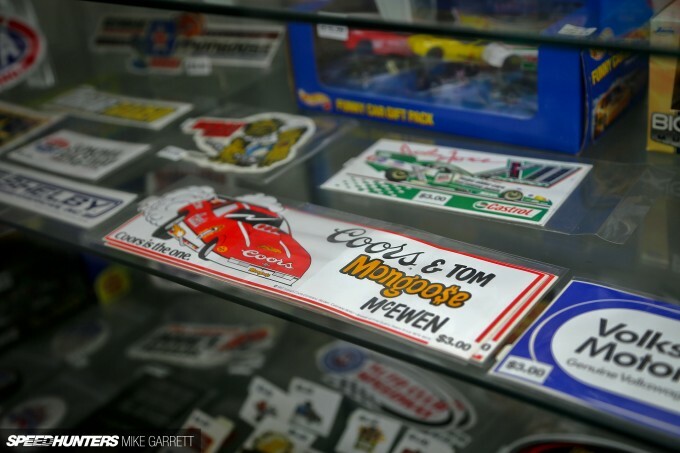 I came across this hobby shop back in 2000 when I was in Anaheim for the big Ford show at Knott's Berry farm. For the life of me, I couldn't remember the name til this article! Thanks for the memory jog, now I gotta remember to bring an empty suitcase on my next vacation to LA! Great article and agree with others that these hobby shops are becoming sadly rarer every day. That place is awesome. 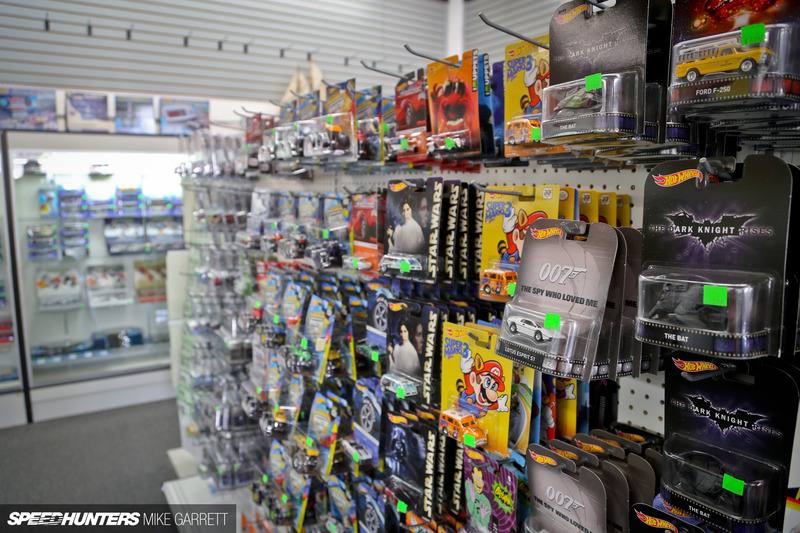 Been going there since i was a kid in the late 80's when it was called Century Models. 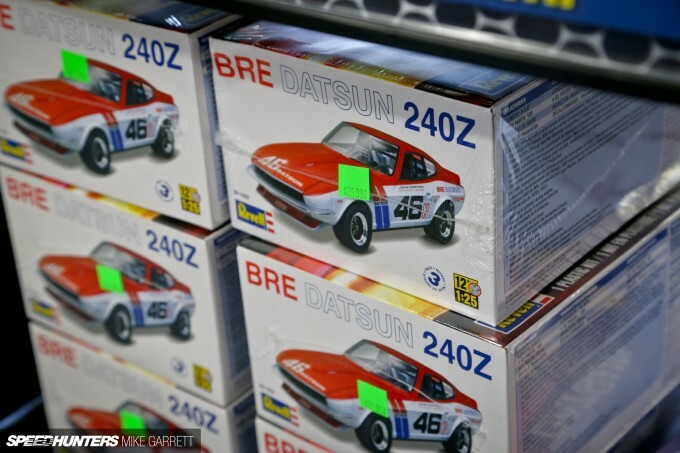 I wish they still stocked japanese 1/24 car kits as much as they used to but i'm sure the exchange rates have something to do with that. One of my favorite places to pass the time and sometimes stumble upon some rare stuff. Awesome article! 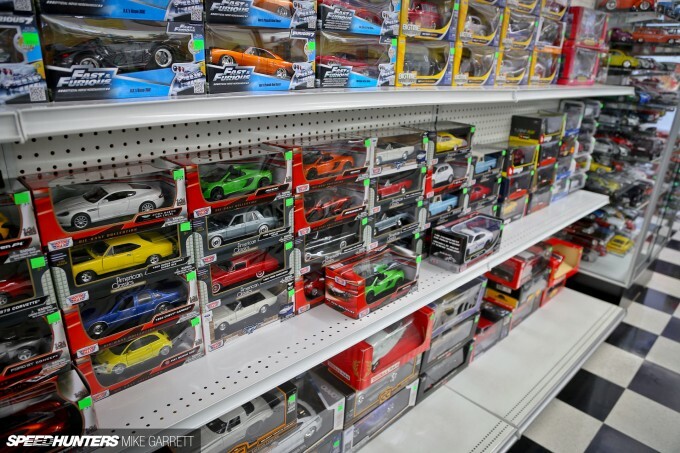 Crazy to see some of the prices on those Hot Wheels Collectibles multi car displays. I had picked up two complete series' of those back when I was heavy into collecting, and sold them as a cheaper lot when I was trying to pull together money for College. 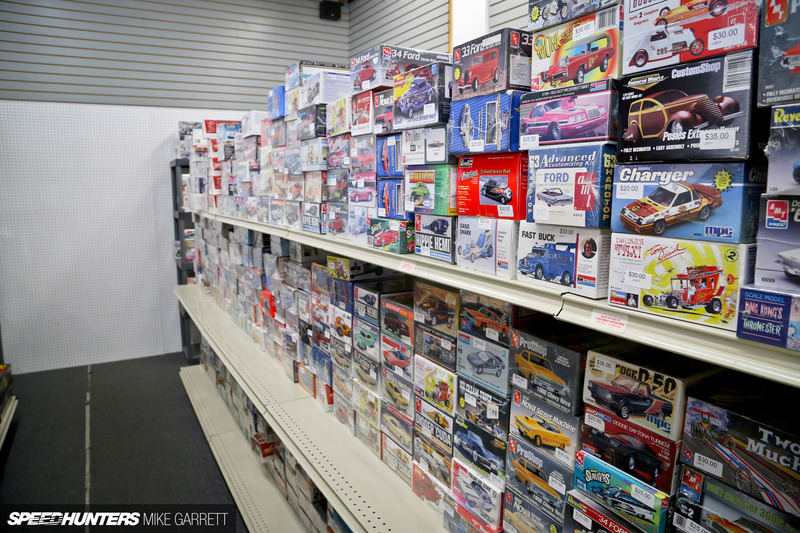 Definitely sad to see the decline in hobby shops. Here in London, Ontario I have seen many close over the past few years. nu gundam 93 I actually have an unbuilt Pocher F40 K55 that has been waiting to go to a good home if you're interested! So many things to love, but that BRE Fairlady will always do it for me. 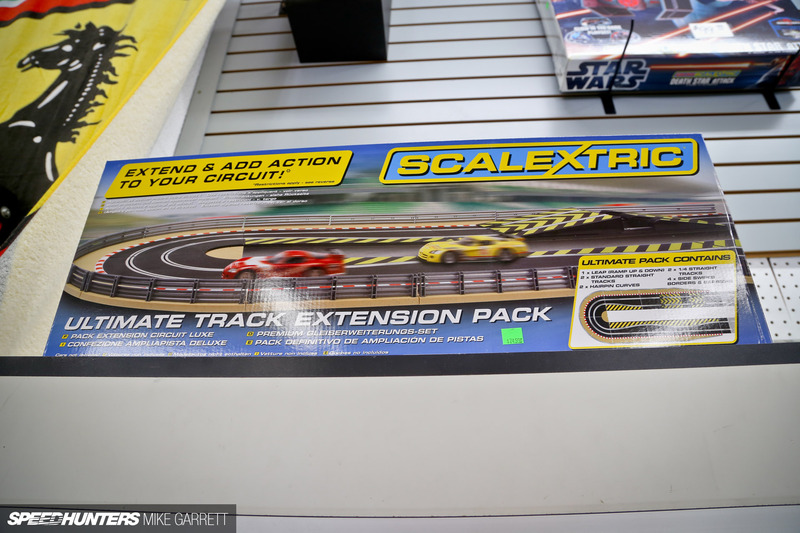 I remember making a large slot car track by taking a door and painting it green, and nailing down the tracks. The smell of those electrical engines is just nostalgia road. We need a feature on Amalgam models. Jay Leno's garage did a good video recently but I need more! Dude, that place is seriously B. 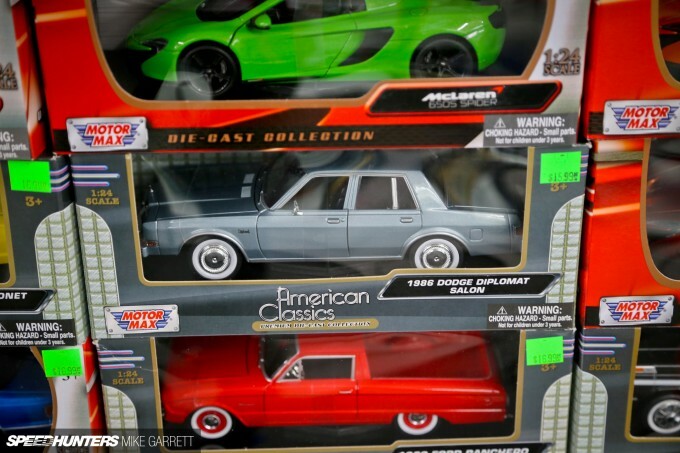 A., but WTF is up with the Dodge Diplomat sitting on gangster whites??? 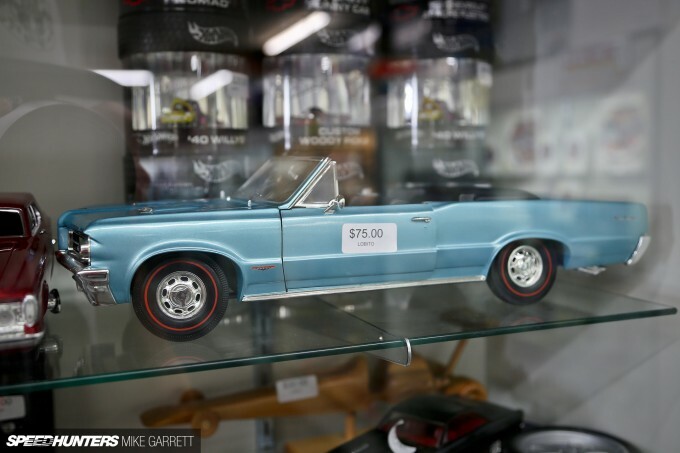 Roman64 You know, I've actually been wondering if a Diplomat would make a good, cheap place to start a Pro Touring type build. V8 power, FR layout, big car... That model would've gone home with me if I'd been there, jut to tear it apart and see if it would look good low on bigger wheels. Adding the right wheel and stance treatment will improve any car's look. De-badging, de-chroming, mesh grill replacement, wheels done! That's kind of why so many cars are done over and over. Some cars are obviously better baseline starting cars from the factory. 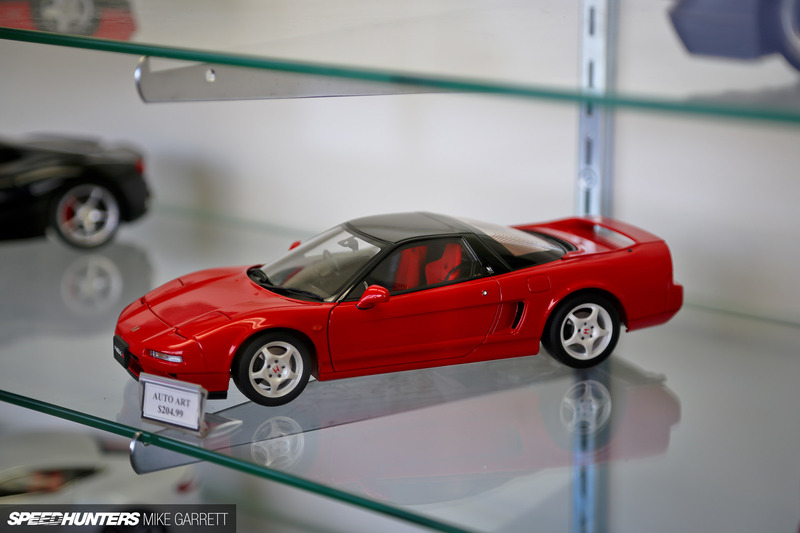 Those cars are a lot cheaper in the long run since GM, or Ford did all the hard work for you. 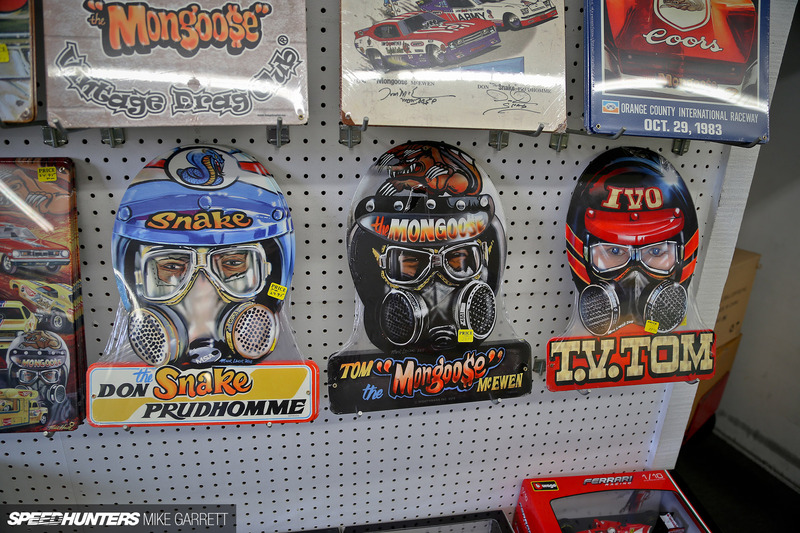 Plus, they'll look a whole lot cooler! 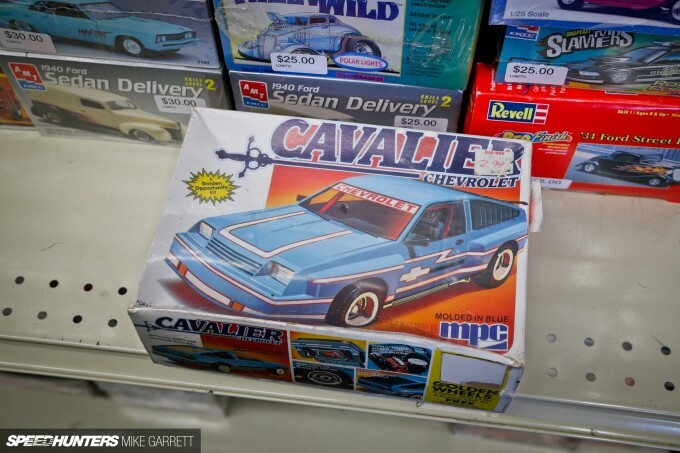 Suggestion, try a late 77-89 Chevy Caprice/Impala. Think 80's four-door cop car. Those are similar in appearance, but came with V8s and are pretty much bullet-proof stunt cars. Benefit is, it's been done before, and they're still square, uglish, and different. Diplomats were Police cars too. Build for V8's had torqueflites and a big enough rear axle. The beauty is a 360 is and easy bolt in a manual trans is doable. Cross torsion bar suspension make them easy to lower and rear leafs can be built to order. Front discs can be upgraded and rear discs from other Mopar stuff is a bolt on. Truthfully lowering a Diplomat with nicely painted police special wheels and some fat tires, beefing the suspension and installing a 360 and a different trans and rear gears would be pretty simple. 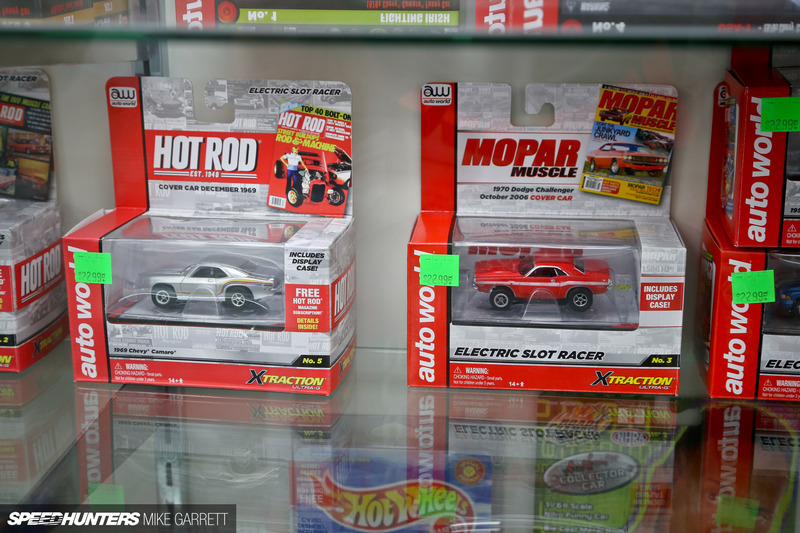 The Mopar police special wheels of that era are similar to GM rally wheels and use a nondescript dog dish hub cap. Easy Peasy, just a little imagination.